Ram Gopal Varma has been going through a dull phase as none of his recent films have clicked at the box office. But that hasn’t stopped this maverick director from churning out films one after the other. He is now back with yet another gangster flick titled ‘Satya 2’ . 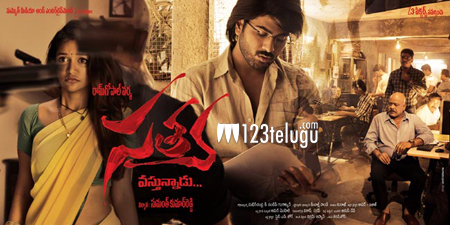 Starring the very talented Sharwanand, ‘Satya 2’ has hit the screens today. Let us see how it is. Satya(Sharwanand) lands himself in Hyderabad with only one intention and that is to grow big and powerful. He starts his life by working for a construction company, which is headed by a very rich businessman named Eshwar Rao (Mahesh Thakur). Eshwar Rao and his friends have links with gangsters and use them to strike against enemies. During one particularly tough situation, Satya steps in and salvages a precious deal by executing a brilliant hit against Eswar Rao’s enemies. Impressed by his tactics, Satya is given much importance in the gang. Slowly but steadily, Satya becomes the head of the gang and starts making a name for himself in the underworld. He sets up a criminal organisation and calls it the ‘company’. This ‘company’ starts becoming a parallel power centre and the government is hell bent on taking it out. Police officials who try to track down company members are ruthlessly murdered. Out of desperation, the Police Department brings a veteran cop out of retirement to tackle this menace. Will he succeed? Who is Satya? This is what Satya 2 is all about. When compared to some of RGV’s recent duds, Satya 2 is definitely better. Sharwanand is the highlight of the film. He looks apt as Satya and once again proves what a fine actor he is. His dialogue delivery and mannerisms are a major asset for this film. First half of the movie has some gripping scenes. Some of the crime scenes have been conceived well. For about 20 minutes before the interval, the film is really very good and one gets to see glimpses of a vintage Ram Gopal Varma. Story of Satya 2 is nothing new. There are some similarities with Mahesh Babu’s ‘Businessman’. The intensity and suspense could not be maintained throughout the film. After a gripping pre-interval episode, the hopes and expectations of viewers will rise. But the second half is a let down. Songs are a big hindrance to the film. They come as roadblocks. The pace of the film could have been better in the second half. Another big issue with the film is the lack of star power. Except for one or two known faces, Telugu viewers will not be able to identify any of the actors. Anaika Soti is an eyesore and her performance is quite bad. As in all RGV films, technical values are decent. Luckily, RGV does not experiment too much with the camera angles this time. The ‘eagle camera’ has been used well. The aerial shots of Hyderabad look quite good. Dialogues are pretty OK. Background score by Amar Mohile is just about ok and it lifts the film to a certain level. RGV’s direction is pretty mediocre. Though he creates a lot of curiosity in the first half, he loses it with a predictable second half. On the whole, Satya 2 is a disappointment and is no where close to the iconic Satya. RGV shows us what he is capable of, for about 20 minutes before the interval. With those scenes, one gets the feeling that he is back on track, before everything goes for a toss in the second half. Let us hope RGV replicates that brilliance for a full two hours in his next project.